When President Obama projected North Carolina to win the national title before the 2009 NCAA tournament, Duke coach Mike Krzyzewski famously joked that the Commander in Chief should spend his time fixing the economy rather than filling out a bracket. 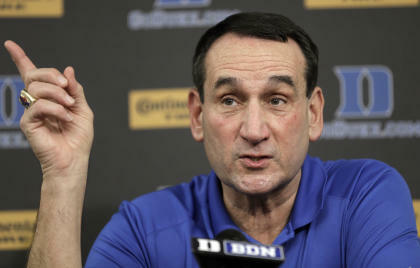 Turns out Krzyzewski doesn't have any issues with a basketball coach weighing in on political issues. After receiving an award at the Association of the U.S. Army conference last month, Krzyzewski told an audience of military officers, defense contractors and Army supporters that Obama has erred by pledging not to use ground troops to fight against ISIS. The comments went previously unreported until the Daily Beast published them Tuesday. “I know it’s upsetting to many of you when you hear ‘no boots on the ground,' " Krzyzewski said. "It upsets me too because that’s like saying I’m not going to play two of my best players. Because that’s what you are trained to do. And for decades and decades, the fact that we are a free country and we don’t play home games here is a result of having boots on the ground. “It’s about letting your opponent know that we are going to use our best players. Now whether you use them or not, that’s up to the coach. You never tell an opponent you are not going to use [them], like I’m not going to play Grant Hill, J.J. Redick, [Christian] Laettner. Like for the Olympics, 'Hey, Spain, I’m not going to start LeBron [James] and Kobe [Bryant] tonight.' I don't think you do that." Ignoring Krzyzewski's message for a moment, the metaphor he uses isn't ideal. It can be cringeworthy when coaches compare sports to a war. To compare an actual war to sports is even worse. It's also surprising to hear the legendary Duke coach weigh in on foreign policy at all. Kryzewski graduated from the U.S. Military Academy, served in the U.S. Army from 1969 to 1974 and no doubt has strong, informed political opinions, but generally he has previously kept them to himself. The stinging criticism from Krzyzewski inspired some funny social media commentary, none more hilarious than this tweet making fun of Duke's recent NCAA tournament losses to unheralded Lehigh and Mercer. Whether or not you agree with Krzyzewski's foreign policy take, there was one aspect of his speech most everyone would applaud. Said Krzyzewski to the U.S. army veterans in attendance: "I want to thank you for the countless times your boots have been on the ground, and as a result have given me an opportunity to live in a free country, to do what I want to do, to coach the United States team, the Duke team, whatever. So on behalf of the ordinary people, we love you and thank you for doing that."